Hello and welcome to the complete resource for homes for sale in Tuscany Calgary! 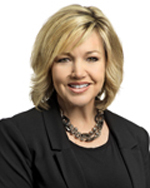 I'm Crystal Tost, an award-winning Calgary REALTOR® affiliated with RE/MAX Calgary for over 18 years. I'm excited to help you find the perfect home you're looking for in the Tuscany, Calgary neighbourhood like I have done for many others. It is a pleasure to work each day helping buyers find homes for sale in the Tuscany real estate market. Choose from thousands of houses, townhomes, condos and other forms of real estate in Tuscany, Calgary. 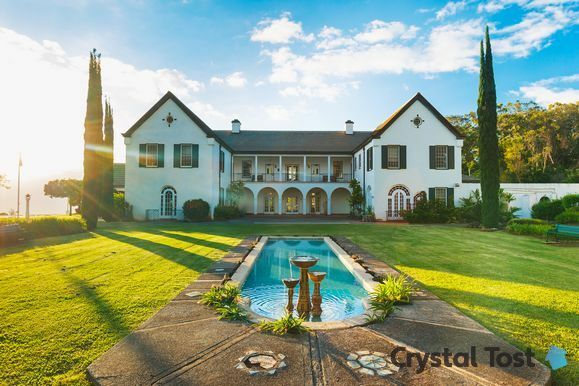 View detailed Tuscany property information and data such as bedroom and bathroom amount, floor levels, property photos, property slideshows and video tours of homes. I'm happy to answer any questions using my expertise in Tuscany real estate to find you the home you've been looking for. All Homes For Sale In Tuscany Calgary appear here on this page, updated daily within seconds from being released by the Calgary MLS®. There are media, extensive information and helpful tools to easily find a home that suits your needs in the Tuscany real estate market. Get in depth community information about Tuscany as well. This page has the most in depth information relating to Tuscany, Calgary real estate home buying. Enjoy using my website calgarylistings.com and contact me to help you find homes for sale in Tuscany. With many years of success helping my clients find homes for sale in Tuscany Calgary, I look forward to do the same for you! 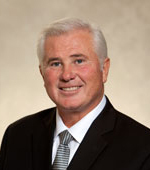 With my expansive wealth of experience and knowledge of the Calgary real estate market, I have become the Authority on all aspects of Calgary Real Estate and its many communities. 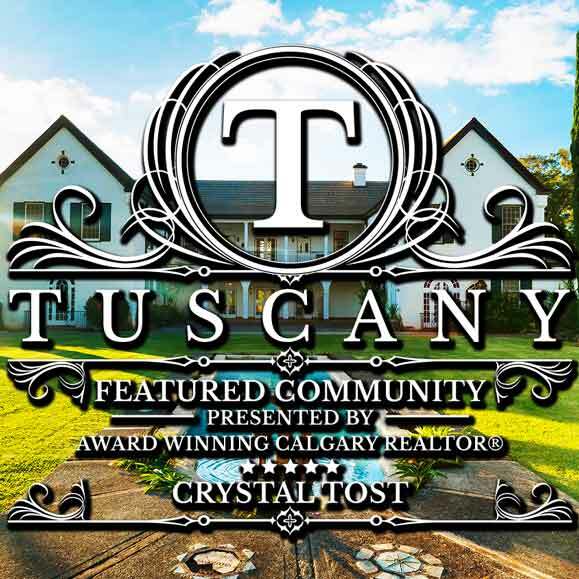 The featured community here is Tuscany, Calgary which I look forward to help you with, using my expertise in Tuscany real estate. Find Tuscany homes for sale with tools to easily find a home that suits your needs. You can sort by price (low to high, high to low) and days on the market (most recent Tuscany listing or one that has been on the market a while - Tip: Homes on the market long may have a reduced price). I want to help you build a lifetime of happiness and memories when I help you find your Tuscany home. I have been assisting clients for many years with the purchase and sale of homes in Tuscany. You can read below the many great testimonials I have received from happy customers. if that is not enough you can check my great reviews on Google. I use my expertise and wealth of knowledge pertaining to the Tuscany real estate market to help you choose the right home for you and your family. I am a top 3 RE/MAX REALTOR® and I achieved such an accolade by delivering successful transitions for my clients. I created this page on Calgarylistings.com to be the most helpful website for home buyers searching for homes in Tuscany, Calgary. If you are a Tuscany homeowner and considering your options of selling your property, please give me a call and make me your number one choice for Tuscany home transactions. It will be an experience filled with excellent results! My contact information is below, contact me about any property in Tuscany your interested in. According to data provided by the City of Calgary, in 2014, the Tuscany, Calgary Community had a population of 19,465. The majority of those residents (60%) are between the of age 20-64 years old. The most common type of home are single family homes, which is 84% of all the homes there. Followed by single family homes are apartments, which make up 8% of all the homes in the neighbourhood. 92% of the residents in Tuscany own their home. From 2009 to 2014 the population of Tuscany grew a modest 7%, which it grew from 18,272 to 19,465 residents. Out of that population, 84% live in single family homes, 8% live in apartments and 6% live in townhouses. View the map of Tuscany, Calgary, Alberta below. Below is accurate data concerning the Tuscany Calgary Real Estate community which is verifiable by the Calgary Civic Census, which is backed by information from the Census of Canada. The definition of a dwelling is a self contained unit with full cooking, sleeping and sanitary facilities which are not part of an institution. • Apartment: a structure originally designed and built to contain at least three dwelling units on three or more levels. • Converted structure: The additional dwelling unit in a structure that contains more units than the building was originally designed and built to contain. • Duplex: A structure originally designed and built to contain two dwelling units, either side-by-side or one above the other. • Single family dwelling: A structure originally designed and built to contain a single dwelling unit. • Townhouse: A structure originally designed and built to contain three or more attached or semi-detached dwelling units. The homes in Tuscany, Calgary are a segment of a 1000 acre master planned neighborhood on the western section of the city. Although about 90% of Tuscany homes are single-family detached homes, there are also semi detached houses condos and lofts in the community. Tuscany real estate possesses a grand corner just NW of Calgary with more than 1,000 acres of land and more than 250 acres of green space. This neighborhood highlights a stunning perspective of the Rockies, walkways and gorge. Tuscany homes available to be purchased are perfect for those searching for good mixture of single family homes from starter homes and everything in the middle. Homes available to be purchased in Tuscany were basically constructed from the late 1990s to the mid 2000s and are available in a vast variety. The inhabitants of Tuscany have a “Home Ownership Association” (HOA), charge of about $262 to be paid every year. For the individuals who work in downtown, arriving there is a simple twenty minutes drive, and for those with kids, it's a significantly simpler five minutes drive to most schools in the neighborhood. Tuscany is located in the north-west of Calgary Just by the Stoney Trail south-west. A perfect blend of low-rise condos, townhouses and single-family detached homes is offered by this community; most of which have amazing views of the Rocky Mountains to the west, Canada Olympic Park and the Bow River Valley. With a Nose Hill Park, Canada Olympic Park, Bow River and Bowmont Park Natural Area just a couple of minutes away from your home, you can never get bored in this neighbourhood. More so, there are Arbour Lake, Valley Ridge, Lynx Ridge and Scenic Areas surrounding this neighbourhood. 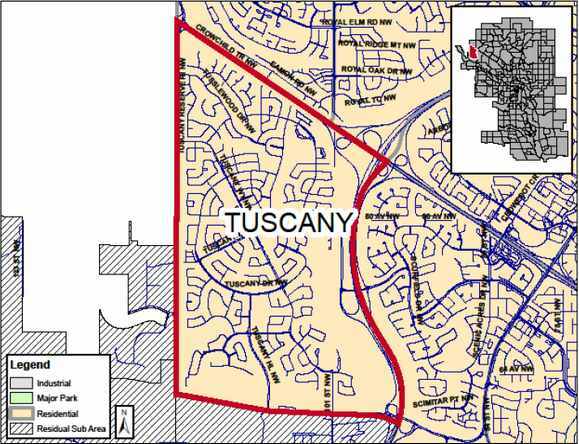 Tuscany is a residential neighborhood in the north-west quadrant of Calgary, Alberta. It is situated at the western end of the city, and shares a boundary in the north with Crowchild Trail, the east with Stoney Trail, in the south with Bearspaw Dam Road and the west with Twelve Mile Coulee Road. This neighborhood was set up in 1994 and it was named Tuscany, for the region of the same name in Italy. Tuscany is one of the hottest and most vibrant of the neighbourhoods in Northwest Calgary. Created by Carma, its real estate provides a blend of single-family detached homes, low-rise condos and townhouses. Most of which have astounding views of the front range of the Rocky Mountains on the west, Canada Olympic Park and the Bow River valley. The planning of this Calgary neighbourhood is exemplary with distinguishing sights such as the Rockies, Bow river valley, panoramic views of downtown, private clubs and of course, beautifully designed homes. This makes the community of Tuscany experience a steady rise in popularity and residents. Avenue Magazine recently ranked Tuscany as the 11th best community in Calgary! It's not hard to imagine why. This upscale NW community possesses lovely mountain views, a top class community centre and a 170 acre natural ravine system. Not only that, but this family orientated neighbourhood was planned to adequately accommodate both old and young residents. This neighbourhood consists of a variety of homes, from senior homes to condo complexes to single-family homes thus; you could say this community has it all. It has been a very popular MLS®community amongst home buyers for several years now. The price range for condos in this community falls between $150,000 and $900,000 while home could go for prices between $280,000 and $1,629,000 (As of October, 2015). Created by Carma, Tuscany is the best neighbourhood anyone could ask for and this is the reason it's so popular. This neighbourhood is in the NW quadrant of the city, possessing views of the mountain, entrance to the Rockies while just a brief commute from downtown. It possesses wonderful amenities such as The Tuscany Club which is an exclusive, social office only for the residents of Tuscany. Not too far away is the YMCA, a gigantic provincial shopping at Crowfoot Center, a pathway fusing territorial parks, and the city's bikeways. Inhabitants are not too far from the McMahon Stadium, SAIT, The Calgary Foothills General Hospital and Mount Royal College. A natural ravine framework of up to 170 acres which includes Twelve Mile Coulee winds its way across the boundary of Tuscany, offering sharp slopes for mountain biking, paths for trekking and milder trails for a daytime walk. This community is very attractive with its features consisting of luxurious executive homes, single family homes, condos as well as starter homes. Amazing panoramic views, more recent builds and new floor plans are just some of the amazing features of homes in the neighbourhood of Tuscany. There are also quite a number of amenities residents in Tuscany can enjoy. They include a central shopping plaza, ball fields and parks. Also available are a neighbourhood pub, gas station, pharmacy, grocery store and other local service shops. This plaza can be used as a one-stop shopping centre for all your daily needs. The Tuscany Residents Association has various recreational facilities such as children’s playground, two tennis courts and a hockey stadium. Also available are several social functions, a local newsletter, book swaps and a community garden. Because of these, purchasing homes for sale in Tuscany is a great idea. Due to being a profoundly lively and vivacious neighbourhood, full of opportunities for self-improvement and happiness. There are a number of parks in this community, providing great recreation to residents. In case you are seeking adventure, you can go to 12 Mile Coulee Park. It is great for walking and biking. Nose Hill Park offers hiking and lots of grassland to pass through. Nose Hill Park contains one of the most significant examples of this grassland ecosystem left on the Canadian prairies. From the plateau, there are vistas including the Rocky Mountains, Bow River Valley and the vast plains to the east. The Tuscany Club is an exclusive, multi-purpose recreational facility with a recreation programmer. The Tuscany Club provides Carma’s Tuscany residents with four seasons of activities right in their own backyard. The 16,000 square foot recreation facility includes a large gymnasium, two meeting rooms, multi-purpose rooms, kitchen facilities, office facilities and a skate change area. Twelve Mile Coulee is in the northwest portion of the city and was established in 2001. The coulee and nearby road were originally named this because they were approximately 12 miles from the post office in Fort Calgary and the area served as a mail drop on the old stagecoach run to Cochrane. In this park you can visit a classic prairie coulee. A coulee is the regional term for a small valley or gully. The term originated with the Metis, who used the French verb "couler," meaning "to flow," to describe this land form where seasonal water flows from snow-melt or heavy rains. As in most coulees, there is a mix of grassland, shrubs and trees which play an important role in the prairie ecosystem. Southern exposures of the coulee are the driest and are primarily native grassland consisting of Rough Fescue, Perry Oatgrass and Spear grasses. Intermixed with the grasses are wild flowers including Prairie Crocus and Golden Bean. On the moister northern exposures and shaded areas one finds shrubs like willows, Red-osier Dogwoods and American Silverberry as well as trees such as Trembling Aspen, Balsam Poplar and White Spruce. The grasslands and tree/shrub communities in prairie coulees are home to many species of animals which, with a little luck, you can still find in Twelve Mile Coulee. Look for Richardson's Ground Squirrels (often incorrectly called gophers) and the mounds of Northern Pocket Gophers (which are true gophers). Watch also for deer, coyotes, porcupines and even the odd Red Fox. Overhead, you may see circling raptors including Swainson's Hawks and Northern Harriers. In the trees there are Nuthatches, Woodpeckers and several species of Warblers and Vireos, and in the grasslands look for native sparrows. The dominant land form is the coulee itself, which slopes southerly toward the Bow River. Along the eastern slope there are sandstone outcrops which are part of the "Porcupine Hills Formation" of bedrock that underlies the entire city. Toward the south end of the coulee, a large outcropping of bedrock is one of the best and most accessible examples of this formation in the city. Archaeological artefacts, including a 2000 year-old stone circle or tipi ring, indicate that Aboriginal people had been using the park area for hunting and camping for at least 8000 years. Since the 1800's, European settlers used the area for farming and ranching. Bowness Park is located along the Bow River between Stoney Tr. and 85 St. N.W. A shallow lagoon runs along the along the park's southern edge, a favourite spot for paddle boating in the summer and ice skating in the winter. Bowness Park is highly used for picnicking and accessing the Bow River. Note: launching a personal boat, canoe, kayak or similar watercraft in the lagoon is prohibited. Watercraft rentals are not currently available but may be available soon through the new tenant of the tea house. Bowness Park was built before the First World War by John Hextall, a local land developer. It was built in the town of Bowness as a weekend retreat for nearby Calgarians. Baker Park is the beautiful Calgary park across the Bow River from Bowness Park and is the most popular park for outdoor weddings. Baker Park is the site of the former Baker Centre Tuberculosis Institution and was developed as a river side family recreation park. Bowmont Park is a large natural environment park that lies along the northern bank of the Bow River in the northwest part of Calgary and is undergoing changes as part of the Bowmont Park improvement project. Bowmont Park lies along the northern bank of the Bow River in the northwest part of the city. The park was created in the early 1980s and occupies about 164 hectares. The name is a contraction of the names of the nearby communities of Bowness and Montgomery. Bowmont contains grasslands, valleys fed with permanent sources of water and bushy off-shore islands. There is also a mature Balsam Poplar riverine forest. This type of forest was once very common along river banks across the North American prairies. But, because these forests rely on periodic flooding for regeneration and most of the rivers have been dammed, the forests are under threat throughout much of their range. The waters of the Bow River are home to species such as Canada Geese, Common Mergansers and several species of gulls. The trees and shrubs along the river are migratory routes for many species of warblers and vireos. There is ample evidence of the presence of beavers as many of the trees have been wrapped with wire to protect them from being chopped down. If you like amphibians, Boreal Chorus Frogs and Tiger Salamanders have been seen in the inland ponds. At the top of the cliff face, you can see a thin layer of soil. This is the rich soil that nurtures the grasslands and crops that are so important in the European history of this area. Under the soil are 18 metres of sediment that were deposited on the bottom of Glacial Lake Calgary. The lake was formed as the last glaciers melted but the runoff was blocked by an ice dam further down the Bow River Valley. Below the sediments lies the bedrock called the Porcupine Hills Formation. This bedrock was formed about 65 million years ago. When water percolates down from the surface, through the sediments it absorbs calcium carbonate. As it strikes the bedrock it flows sideways and exits out the side of the valley resulting in the falls in Waterfall Valley. The water then deposits the calcium carbonate on the algae covered rocks, producing the tufa. Two sections of the park have undergone major changes. One area was used for agriculture and commercial greenhouses and the other for a gravel pit and concrete plant. These areas are being restored to a natural environment. Nose Hill Park is a natural park that lies in the northwest part of the Calgary and is surrounded by 12 residential communities and covers 11 square kilometres. Nose Hill Park has many hiking trails and dedicated off-leash areas. Nose Hill Natural Environment Park lies in the northwest part of the city, surrounded by 12 residential communities. The park was created in 1980 and covers over 11 square kilometres. The hill most likely gets its name from the fact that, from certain locations and with a little imagination, it looks like a nose. Take a hike on the hill, but slow down to appreciate the Rough Fescue grassland that you are passing through. Nose Hill Park contains one of the most significant examples of this grassland ecosystem left on the Canadian prairies. From the plateau, there are vistas including the Rocky Mountains, Bow River Valley and the vast plains to the east. The trees, shrubs and wildflowers in the coulees are very different from the species found in the fescue grassland. Apart from the native grasses, one of the dominant species in the park is the Trembling Aspen. The aspen, along with the willows occupy the north-facing slopes of the coulees and provide a refuge for many of the wild animals living in the park. Large mammals such as deer and coyotes can be seen roaming the grasslands and coulees. The park is home to porcupines, northern pocket gophers, Richardson's ground squirrels and several species of mice and voles. These smaller mammals are the main prey for the northern harriers and Swainson's hawks, which are often seen in the skies above the park. Please note: although coyotes also mainly feed on small mammals such as mice, they have on a few occasions attacked and killed pets in Nose Hill Park. If you want to ensure the safety of your pet, keep it on a leash at all times (even in the designated off-leash area on the top of Nose Hill). Coyotes are generally no threat to people but should be treated with respect and never approached or fed. Nose Hill and Broadcast Hill, which lies on the other side of the Bow River Valley, are the two remaining examples of the high plains which once covered this area. Ancient rivers, successive glaciers and their run-off have eroded the landscape producing the surrounding valleys and lowlands, leaving the two hills towering over the area. The most recent glaciers left their mark in the form of "glacial erratics" which consist of rocks and debris carried from other places and deposited in the park. One such erratic is on the east side of Nose Hill and was once a part of Mount Edith Cavell in Jasper National Park. The park contains significant archaeological sites, including stone circles. These were formed by using stones to hold down the edges of tipis and are called "tipi rings". Because of it's height, the hill was also a sacred place used for ceremonies and burials. European settlers began using the area in the late 1800's for farming and ranching. Large areas of the plateau have been ploughed and planted to agricultural crops. Some of these areas are being returned to native grassland. There is an old gravel pit on the plateau which is slowly being reclaimed by nature. In the '80s, much of the park was destined for residential development. However, vigorous citizen action saved the land for the magnificent park we have today. Tuscany has many shops and services for residents to enjoy. These include Angels Hair Salon, Domino's Pizza, Ducks and Company, Panda Flowers, Kaleidoscope Kids Preschool, Lifetime Vision Care, Mac's Convenience & Gas Bar, Scotia Bank, Sobeys, Sobeys Pharmacy, Starbucks, Subway, Rexall Drugs, The Last Straw Pub, Tuscany Chiropractic Clinic, Tuscany Dental, Tuscany Fine Dry Cleaning, Tuscany Medical, VHQ Entertainment, Tuscany Veterinary Hospital, Western Cellars and many more. Northland Village Mall is an attractive, regional shopping centre located in the strong northwest sector of Calgary. This geographical quadrant remains one of the fastest growing communities in Calgary. The shopping centre pulls from a local customer base of over 362,388. Northland Village has many destination retailers such as Winners, and major tenants include Wal-Mart, Best Buy and Home Outfitters. Northland Village Shoppes, located on adjacent property to the enclosed shopping centre, comprises about 7,000 SF of the GLA. The Crowfoot mall in Calgary, Alberta is situated just north of Crowchild Trail and west of Nose Hill Drive in NW Calgary. It contains about 350 stores. Tuscany Market features many shops and services such as a chiropractor, dental, pizza, medical offices, banks, grocery stores, restaurants, winery and a veterinary clinic. Tuscany Market is located in the northwest part of Calgary, on the corner of Tuscany Way NW and Tuscany Blvd NW. The easiest access is from Alberta 201: take Exit 39, join Scenic Acres Link NW, turn to the right onto Tuscany Blvd NW. Tuscany Market is located not far away from Alberta 201. Tuscany is home to many top schools, information on them are below. Children from kindergarten to grade four attend Tuscany School right in the community. Tuscany School (Public K-4) is located at 990 Tuscany Drive NW - 403.777.8060, St. Basil School (Catholic K-8) is located at 919 Tuscany Drive NW - 403.239.5308. Tuscany Middle School is planned for the community within the next three years and St Basil Elementary School is currently under construction. Tuscany is a short drive from the University of Calgary, ACAD and SAIT. 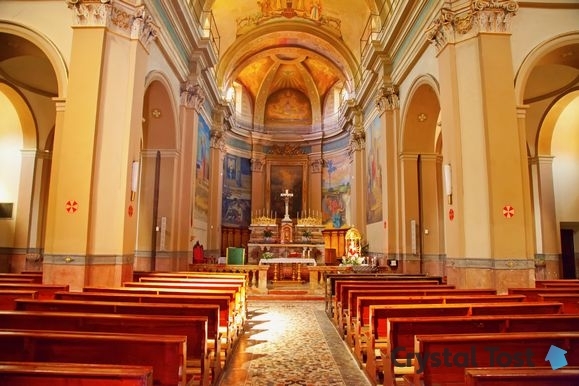 The website http://www.cssd.ab.ca/schools/ has a complete list of Catholic schools available in Tuscany, Calgary. The following churches are located in Tuscany, Calgary. In April 2000, a volunteer organization known as the Tuscany Community Association, dedicated to addressing the concerns of the neighborhood, including planning of recreation activities and community functions as well as effectively representing the community in civic matters was established. A membership fee of $25 is charged yearly in this organization. One membership takes care of a whole household in the activities of the Tuscany Community Association and has an entitlement of a vote at the AGM. Tuscany is also a part of the Calgary North West Provincial Electoral District. Tuscany Calgary Transit Bus #74 and 174 are the available Public transportation for this neighborhood. Interested In Living In Tuscany Calgary? Need more info about homes for sale in Tuscany Calgary? Contact me, Crystal Tost, for a free consultation for your Tuscany Calgary real estate needs at 403-264-7653 (SOLD). Searching houses for sale in Tuscany, Calgary, Alberta has never been more convenient. 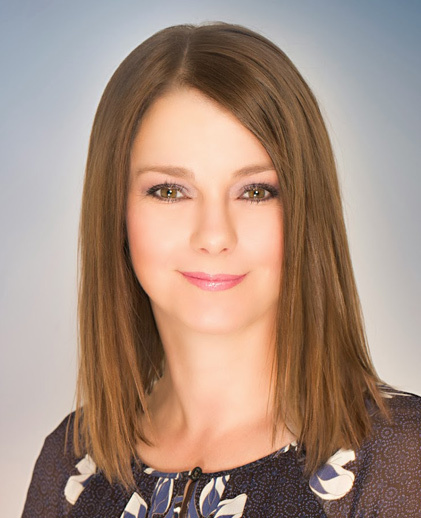 With calgarylistings.com, you can easily browse through Tuscany, Calgary, AB homes for sale, townhomes, and condos from Tuscany most experienced and award winning Real Estate Agent and Top 3 Calgary REALTOR Crystal Tost. Thanks for taking the time to read relevant information about Tuscany, Calgary homes for sale which includes real estate listings, up-to-date data, community information, amenities, property descriptions, photos and maps.